Admittedly, I'm not the greatest cook. In fact, I struggle with making a single meal without setting off the fire alarm. There is, however, one thing I can definitely help with when it comes to dinner parties and alike, as things get closer to the holidays. And that is decorating. You can count on me for table top DIYs and beyond, if you ever need help in that department. Though, I suspect you're pretty good at that stuff as well. 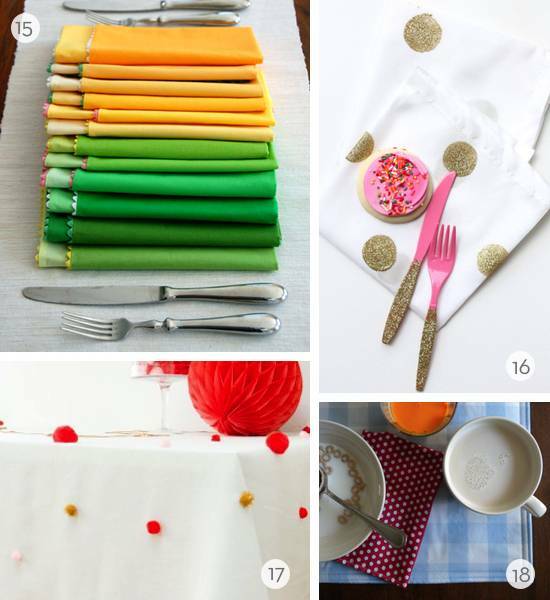 So it's probably easier to just give you a list of cool DIY ideas for placemats, tablecloths, and napkins. Ready? Do you have a favorite? Share which numbers you love most in the comments below.